The championship was again a battle between Ken Smith, in David Abbott's Lola T430 as usual, and Steve Ross in his McRae GM1, and again it was Smith who prevailed by a handful of points. After dominating the Lady Wigram Trophy at Ruapana Park in October, Smith had the Lola T400s of English visitors Michael Lyons and Mark Dwyer for company at Hampton Downs, but held them off to win the first weekend. The following weekend, Canadian Jay Esterer in a McRae GM1 took pole position and victory, with Lyons second. Lyons won the feature race at the Skope Classic, after Esterer's engine failed after winning the first race, but the Canadian came back to win the Classic Speed Fest at Teretonga Park. The series again supported the Australian Grand Prix in March, where Dwyer won from pole, and Australians James Davison, Andrew Robson, and Aaron Lewis were amongst the leaders. With the Australian Grand Prix support race now the main lure, the Australians largely stayed away from the New Zealand races in 2010/11. The VHRR's Historic Sandown and the Philip Island Classic were now huge events, and other events such as the Winton Festival of Speed were attracting increasing fields. 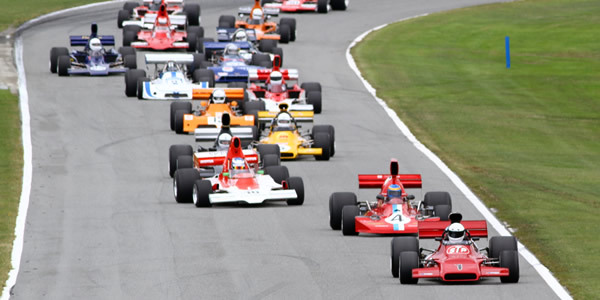 Thirteen F5000 cars made their series debut during 2011, including eight at the Grand Prix meeting alone. Another eleven would follow in 2011/12, as Australia became a magnet for historic F5000s, but the cancellation of the GP support race would see this slow to a trickle over the next few seasons. The Phillip Island Classic in March 2011 had a race for "Groups Q & R Racing, Formula 5000, & Invited Cars", which included 12 F5000 cars in Class A, along with eight Class B Formula Pacific cars, seven Class C cars that were generally F2-ish, and a smattering of other cars including an Indianapolis March 81C. The Winton Festival of Speed in August 2010 - as we're seeing this through the prism of a New Zealand 2010/11 season - had a class for F5000s alongside Groups Q & R, but only Formula Pacific cars and a solitary F2 appeared. Sandown Park in November 2010 had a race for "Groups Q & R Racing Cars & Formula 5000", which included six F5000s in Class A, nine other single seaters in Clases B and C from 1300cc to a Lola T700 Indycar, and a couple of Sports 2000s in Class D.
A total of 41 F5000 Tasman Revival events had taken place by the end of this season. The drivers who had taken part in the most were as follows.